The people of Iraq are protesting in many cities in central and southern Iraq, demanding better services and protesting meddling by the Iranian regime in their country. On Friday, June 20th, the Iran-backed Badr Corps fired upon Iraqi protesters in Diwaniyah Province in southern Iraq, killing one and injuring two more. A number of groups within the country called for continued demonstrations on Friday to protest unemployment and corruption. These protests were later witnesses in the southern provinces of Iraq, as well as Baghdad. Security forces using water cannons to disperse the protesters. A medical source in Diwaniya was cited by the media as saying that a 20-year-old man was among the protesters killed by Badr Corps members, apparently under the guise of protecting the Badr group site. Large protests and demonstrations of thousands of people were also seen in Basra and Ziqar provinces in southern Iraq. 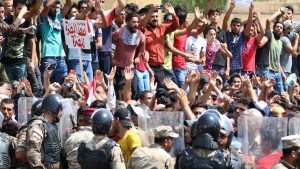 The protesters gathered outside of the governor’s office in Basra, chanting slogans against corrupt political parties that are affiliated with the Iranian regime. Protesters also called for job opportunities and adequate government services. In al-Habubi Square in downtown Nasiriyah, one of the largest cities in Dhi Qar Province, hundreds rallied against government corruption. Protesters flew the Iraqi flag and carried signs demanding that the Electricity Minister, the provincial governor and senior province governors all be fired. Angry protesters attempted to enter the house of Dhi Qar Governor Yahya al-Naseri, but security forces fired tear gas into the crowd, forcing the protesters to disperse. Demonstrators attempted to protest in Baghdad’s Green Zone, home to its government institutions and foreign embassies. Protesters managed to get over the Jomhouri Bridge and were on their way into the Green Zone when anti-riot units appeared with water-cannon trucks and tear gas. Arab media reported that almost 30 protesters were seen suffering the effects of the tear gas in Baghdad’s Tahrir Square. 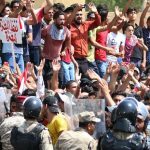 Demonstrations in Iraq have been highly coordinated, and protests at this site were called for in solidarity with other demonstrations taking place in Iraq’s southern provinces. Iraq’s southern provinces have an abundance of oil but struggle to provide their citizens with basic government services. For example, the streets of Basra are strewn with garbage. Pools of water and sewage water are found among the garbage on the streets, which is a major health risk. Drinking water in the province is of low-quality, and the province goes without electricity for seven hours a day. Iran has experienced similar issues with water quality and scarcity in some of its own provinces, due to the corruption of the mullahs’ regime. The Iranian people, with the support of the MEK, have protested this and many other issues in Iran, including the meddling of the regime in other countries. The United States supports the Iraqi people in their peaceful protests for change. Heather Nauert, a spokeswoman for the U.S. State Department, made a statement in support of the Iraq people, saying that Washington believes that poor water and lack of reliable electricity are very painful issues. She went on to say that the Iraqi government also recognizes the right of the Iraqi people to protest peacefully and plans to address more of their issues, including government services, electricity, and job opportunities. The MEK opposes meddling by the Iranian regime in the affairs of other countries and the contribution by the regime to corruption and violence in other countries, such as Iraq.